Breathe in the pine-scented air as you watch the ducks swim by from our beautiful wrap around deck. 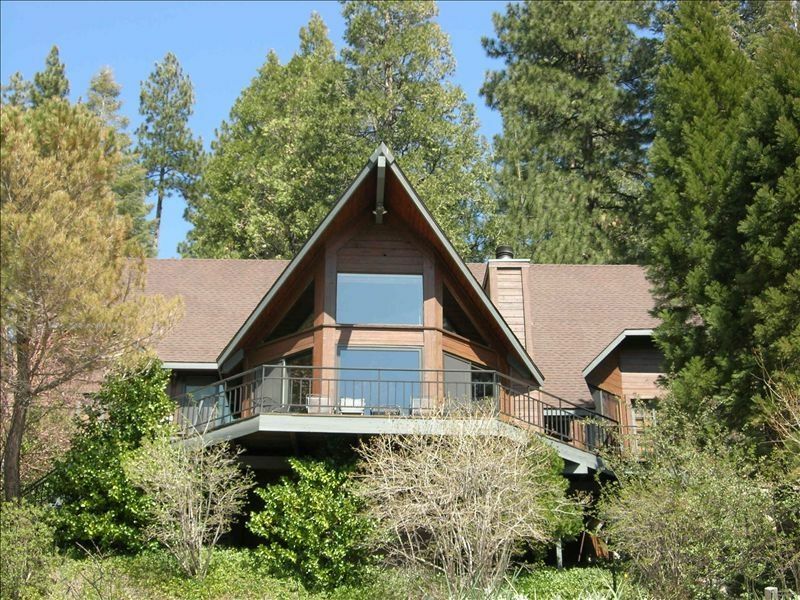 With stunning views of the Grass Valley Lake and Arrowhead Country Club Golf Course from most rooms, this large 4-level mountain home sleeps (15) people comfortably and pets are welcome. This large home is perfect for those special times with family and friends and features a wonderful kitchen with a butcher block island, double oven, and a spacious country style dining table perfect for sharing a meal or a lively board game. More fun can be had upstairs on the fourth level in the game area with pool table, additional television and wet bar. Enjoy the afternoon sunset sipping a beverage as the sun dips slowly over Twin Peaks from either our deck or balcony off the master bedroom. What a wonderful way to relax after great day exploring Arrowhead Village and all its treasures that are just minutes away. Listen to the birds chirp as you take a morning walk or afternoon stroll in this quiet, serene neighborhood. For those who like to fish, the lake across the way can provide hours of enjoyment. Private Beach Club Pass, Wood/Gas Burning Fireplace, VCR, DVD, WiFi Connection, CD Player, Microwave, Dishwasher, Washer/Dryer, Trash Compactor, and Gas BBQ. We reside in the South Bay where we have lived for 22 years. We enjoy hiking and traveling when possible. Our favorite place to go is our home in Lake Arrowhead. We take pride in owning our home and as such, keep the house in tip top condition. After spending many summers and winters renting homes up in Arrowhead we decided to purchase our beautiful home on Golf Course Road. We enjoy the house as much as possible with our friends and extended family and are happy to be able to rent it out for other families and groups to enjoy. The fact that the house has an empty lot on either side provides an atmosphere of privacy. The house has the benefit of a beautiful lake view without all of the noise associated with the boats you encounter on Lake Arrowhead. We enjoy the serenity and wildlife of the area. The abundance of bedrooms and bathrooms along with the living room, bonus room and game room provide lots of space for everyone to spread out. The master has a full bath connected to it. The bedroom level features 2 more full bathrooms and a powder room. Serene and beautiful, Grass Valley Lake fills the vista from our spacious living room and deck. The sunset is unbelievable along with a multitude of gorgeous birds. The driveway holds 3 - 4 cars. password is provided to renters. Flat screen TV and wood/gas burning stove are in the living room. Double convection oven - new. The house is stocked with cooking oil, spices, flour, sugar, condiments and other cooking necessities. Plenty of dishes and glassware to include wine, martini and margarita. The kitchen is fully stocked with a set of dishes for 20. Lots of glassware to include wine, martini, and margarita. Available small appliances include a coffeemaker, crock pot, blender, toaster, etc. The dining table is located in the kitchen and has 8 chairs. Additional chairs located in the house can be added to accommodate a total of 12. As the house has 4 levels, a wheelchair would be difficult. Private Beach Club Pass, Double Oven, Butcher Block Island, kitchen fully stocked with dishes and all needed cooking supplies for large groups. Lovely house. Very comfortable and spacious. There were 8 of us and we had plenty of space. Enjoyed the game room with the ping- pong/billiard table and the kids loved the tv room. Beautiful view from the kitchen and living room. Carole is very nice and accommodating. The house was decorated for Christmas which made us feel right at home over the holiday. I would highly recommend this property. Our family had the best time! Hands down best family Christmas weekend ever. The whole family young and old had things to do. Hoping to visit again. Very nice home overlooking lake and golf course. More than enough space to accommodate all 12 of us and we even had room at the giant dining table for the entire crew, great for meals and games. The owners were very communicative and cooperative and that made preparations and closure vey easy. Highly recommend it. So sweet of you to write such a nice review. I truly appreciate it! This home is probably our favorite mountain home rental and the owner, Carole, was so easy to work with. She was easy to get in touch with prior to, and during our stay. We had a group of 10adults, 1child, and a couple of large dogs. Our dogs weren't an issue and we didn't have to pay extra to have them, which most other places charge. One reviewer mentioned that it wasn't ideal for families with small children, but our 2 1/2 year old was just fine and handled the first two set of carpeted stairs well, and knew he wasn't allowed to go further up without an adult. Driveway fit our 4 medium sized cars, when tightly squeezed together, but one person chose to park across the street for easy access. The home was clean, large, and never felt like our group was cramped. As a matter of fact, every couple was able to have their own room, and we had plenty of spare beds. It's basically a 6 BR home, +game room. There is no AC, but wasn't a big deal if curtains were kept closed when the sun was beaming in, in the early afternoon. The new deck with glass "railing" was our favorite part, and we we enjoyed having our coffee and drinks on it. Kitchen Is fully stocked with everything you will need and is very large, so there can be plenty of people preparing dinner at once. You will, however, return home with sore legs, from all the steps you have to climb, to get to every place in the house. Again, not a deal breaker. The lake across the street makes for a great view, but is NOT swimable/usable. There is a gated park area, accessible with a provided code. It's great for taking the little ones, and your dogs. There are beach passes provided for the main lake, which is about 10mins away. We went to the lake, on Saturday at about 4pm and it wasn't crowded. We were also able to take our dogs there which they loved because they were able to swim for hours. Lake was clean enough that we were able to just dry them off and brush them out, and they were ready to go back in the house, which was good because we couldn't find a hose anywhere. Overall, we loved this place and are hoping to make a trip back in the winter months. Wonderful home great for multiple families/big groups! We really enjoyed our stay at this cabin! We had multiple couples/families and the layout of the home was perfect for this. We enjoyed the multi-level, open feel of the home. Everything was clean, etc. The view was AMAZING!! And proximity to the lake and the sweet little park (private access--cabin includes access) where we could feed the ducks and play on the playground...it was just perfect. I almost enjoyed having access to this lake more than the main Arrowhead lake. It was just so pretty and peaceful. Enjoyed the beautiful new deck they just installed. The owner Carole was very sweet and easy to work with. We will definitely be staying here again and have already recommended it to many friends and family! I have gone through VRBO several times to find rentals for our family gatherings. I have never been disappointed to date. But this rental truly surpassed them all. The information was both detailed and accurate and exceeded our expectations. We are a multi-generational family with the youngest under 1 years old to 70 years old. We all agreed, that we were so happy to have this home and cannot wait to book it again. We had four cars and were able to park in the roundabout drive way. We managed the stairs just fine and had a superb time with a million dollar view of the golf course and the lake. 4 bathrooms and good size bedrooms. The kitchen was not only fully stocked and equipped but all you need to bring is your paper products, spices and food. It was large enough for all 9 of us to both eat and gather during cooking. The living room had a gorgeous view and provided a perfect gathering place during this winter weather and 'game nights'. I couldn't believe we found baby toys for the bath and even eating utensils for our little one. Have a dog? There is a dog bed waiting. Carole was not only easy to work with but so accomadating throughout the entire process. We arrived to celebrate Christmas and the house was fully decorated for our benefit including a tree. Lovely! Two of our children left their pillows at the house, and Carole volunteerted to mail them immediately. Before we left, we all agreed, to have our next 'family reunion' here. We hope to have it in the spring/summer to take advantage of the Lake Arrowhead priveledges provided in the rental agreement. Thank you Carole for your hospitality. We cannot wait to come back! Our house is directly across from Grass Valley Lake and a short walk to the park and playground area. Our house is located 2.5 miles from Blue Jay which features restaurants, stores, a movie theater and grocery. The house is 3 miles from The Village which is a bigger destination with additional shopping and grocery. The Village also features a a play area for children and a concert series in the summer. Weekend rate (other than holidays) is 750.00 (375.00 per night) plus 7% for tax, 150.00 for cleaning and 500.00 for security deposit.